Diamonds are one of the nature’s most precious creations, and those born in April are lucky enough to call them their birthstone. Wondering how to celebrate World Family Day? Here’s a list of top family activities on World Family Day with a focus on things to do in the Waterfront. Discover the latest jewellery trends: stacking rings and statement earrings, layered jewellery and shades of coral with diamonds. It’s your guide to being on trend in 2019. Celebrate International Colour Day with the warm shimmer of the yellow diamond and the spellbinding hue of tanzanite blue. Explore carats in colour with us. Everything on ring etiquette: from matching engagement rings to wedding bands, how to wear your engagement ring and wedding band, engagement jewellery and more. Why are we enchanted by diamonds? Find out why and when to gift fine jewellery, as well as what makes Shimansky tanzanite & diamond jewellery so exceptional. Tanzanite is a rare gemstone that can only be found in the foothills of Mount Kilimanjaro, Tanzania. It has become wildly popular due to its breathtakingly beautiful colour and is the official birthstone for December. Glimmering like the golden African sun, natural Fancy Yellow diamonds are truly exquisite. The Shimansky Fancy Yellow Diamond Collection captures the magical beauty of these rare diamonds in a range of eye-catching and iconic designs. Buying diamond and tanzanite jewellery for the one you love, is a most rewarding experience. Learn how to buy jewellery like an expert. Our insider buyers’ tips will guide you in finding the most valuable and beautiful diamond creation to suit your style. Adorning someone special with diamond gifts for Christmas is a time-honoured tradition. We invite you to browse Shimansky’s Christmas jewellery gift guide to find the perfect diamond holiday gift. Situated on the edge of the world's largest known gold deposit, Johannesburg which is affectionately known as the 'City of Gold' offers visitors a vibrant mix of attractions, ranging from opulent boutique stores and world-class restaurants to five-star accommodation and adventurous day tours. Selecting an anniversary gift should be guided by your personal taste. Our anniversary gift ideas will inspire in finding the perfect anniversary gift for her. Whether you are celebrating your 1-year anniversary, 10-year anniversary or commemorating a lifetime’s togetherness on your 50th anniversary, we understand how important and how valuable these special moments are, which is why we are here to guide you in finding a gift that’s just as timeless as your love for one another. If you are in search of anniversary ideas, our guide will inspire you. Find luxurious and romantic spots in Cape Town to make your special occasion truly memorable. From idyllic weekend getaway spots and romantic restaurants in Cape Town to a range of fascinating, exciting and relaxing activities. What Does It Take To Design A Signature Jewellery Creation? Discover Shimansky’s jewellery craftsmanship stages and the diamond designs’ journey to perfection, from diamond sourcing to jewellery design and craftsmanship. Driven by a pursuit of perfection, passionately applied in every stage of the creation of our diamond designs. One of the key steps in our engagement ring guide is making sure the ring is sized perfectly. Our engagement ring size guide will help you find the perfect fit! Our ring size guide is designed to help you find the perfect fit and to give you some useful tips on what to consider when measuring your ring finger size. Your wedding dress jewellery is important in creating your wedding day look. These wedding jewellery ideas will help you accessorise your bridal look flawlessly. The jewellery you choose to wear with your dress will impact your wedding day look considerably, therefore what you choose to wear is very important. Visiting Cape Town in September is the perfect time to enjoy the best the Mother City has to offer. Here is our list of best things to do in Cape Town in spring. Not only is spring characterised by lovely mild temperatures but it’s the time of year when Cape Town bursts into full bloom. Romantic proposal ideas with creative ways to hide the engagement ring, where to find engagement rings in Cape Town and surprise engagement ideas. Our guide to getting engaged on vacation has a selection of useful tips – from creative ways to hide the engagement ring and surprise engagement ideas to where to find the most dazzling engagement rings in Cape Town and the best ways to propose on holiday. An engagement ring is such a precious symbol of your love, which is why every facet of the ring needs to be carefully considered to ensure it best reflects her unique personality. One of the features to think about is the type of metal. The three types of metals for rings that Shimansky’s master craftsmen work with include platinum, 18k gold and palladium. Rose gold is loved for its vintage and romantic appeal. Although rose gold is currently one of the biggest engagement ring and wedding jewellery trends, this romantic metal has a timeless allure. Originating from Russia in the 19th century and dubbed “Russian Gold”, rose gold has surpassed its status as a passing trend. Getting engaged is one of the most exciting events in your life. Taking the first step in your journey with your soulmate and laying the foundation for a life filled with love requires the perfect engagement ring. Planning a proposal is such an exciting process – one that requires finding the perfect engagement ring that will symbolise your love and commitment for many years to come. When it comes to looking for the perfect engagement ring, it’s important to consider the different diamond setting types. To keep your diamond rings and fine jewellery looking as bright as the day you got them, it’s recommended to have them cleaned by a jeweller regularly. But there are times in between professional cleanings that you may need to clean your jewellery yourself. When planning an exciting day out on National Women’s Day, which is celebrated as a public holiday in South Africa on the 9th of August, it’s good to think about the historical significance behind this special day. Why do we celebrate National Women’s Day? The journey of a Shimansky diamond direct from South African mines to your finger, magnificently shining with brilliance in a perfect setting, is quite something to behold. Along this remarkable journey, the rough diamond goes through several processes – each skilfully perfected. In its rough form, a diamond has potential. Diamonds are more popular than ever. According to insights on 2017 diamond jewellery industry statistics, consumers around the world are purchasing more diamond jewellery than ever before. Last year’s global diamond jewellery market value reached an all-time high of US$82 billion. Once you have found the perfect engagement ring, it’s time to plan a proposal that will sweep her off her feet. Getting engaged is one of the most memorable and magical moments a couple will ever share, which is why it is so important to plan this special occasion down to the finest detail. It all starts with finding the perfect location. Buying a diamond is a thrilling occasion. However, with so many factors to consider when buying one, it’s important to know what to look for in a diamond. Knowing how to choose a diamond will help you make an informed decision when doing your jewellery shopping, whether you are planning on proposing or you want to buy a diamond as an investment. Flanked by majestic mountains and dramatic coastlines, the vibrant city of Cape Town is one of the world’s most breathtaking and popular tourist destinations. Crowned as the number one city in Africa for business tourism events for the fourth consecutive year, and voted as the best city in the world. There’s nothing more remarkable than an extraordinary diamond jewellery creation - especially if the piece of jewellery is connected to a special family member like your great-grandmother. A diamond heirloom is truly a meaningful creation you can carry on from one generation to the next. Popping the question is an exciting and rewarding experience. Proposal statistics have shown that men and women differ quite significantly on this issue, making the endless array of worrisome questions that swarm your mind “Will she say yes? Will she love the ring? Where should I propose?” even more difficult to answer. If you are expecting your significant other to propose this year you probably have already started researching the best engagement ring designers, pinned the prettiest engagement rings and most popular wedding rings to your secret Pinterest board and, perhaps, even tried a few on. Are you and your soul mate ready for the big “I do”? Finding the perfect engagement ring is one of the most important and exciting steps to starting your journey together. But with so many things to consider when it comes to choosing an engagement ring, you may feel a little overwhelmed. Even though your future bride-to-be takes centre stage, the groom needs to feel just as important on the big day. The best way to make him feel just as loved and adored is by making sure he receives a designer men’s wedding band that he can cherish forever. The My Girl diamond is truly a remarkable symbol of the undying love you have for one another. Like the woman of your dreams, the one-of-a-kind diamond is mesmerising and worth treasuring. The unique and timeless design was inspired by the love you share with the special person in your life. To celebrate the remarkable beauty of a diamond, Shimansky, along with a number of influencers in Cape Town started the day off with champagne and ended the afternoon with diamonds. Are things between you and your significant other getting rather serious? If so, you’re probably excited about the prospect that he might pop the question any day now. He may have extraordinary taste, but it's not always a given that you'll receive your dream diamond engagement ring. Shimansky is one of the most sough-after jewellery companies in the world. For many years, Shimansky has been capturing the beauty of a diamond and creating unforgettable jewellery that speaks to one’s heart. To be a dad in a child’s life is considered to be a very important role. Celebrate the times your father stood in and acted as a guide, a teacher and a protector with fun-filled and exciting activities on Father’s Day, celebrated Sunday 18 June 2017. When it comes to buying an engagement ring there’s more to it than meets the eye. Not only will the ring have the perfect combination of fire, brilliance and scintillation, but there’s a lot of other components that make up the anatomy of a diamond ring. Platinum is one of the most precious metals you will find in the world; the metal is considered to be extremely rare, strong and durable making it the preferred choice for use in diamond jewellery. South Africa is known for containing the world’s richest platinum reserves, which are situated in the North West Province. Her love is endless and in most cases, a mom can be compared to a diamond; she represents love, strength and perseverance. There’s simply nothing your mother won’t do to make you happy. Why not return the favour this Mother’s Day by spoiling her with one of these top 10 spectacular celebration ideas? Due to the constant fluctuation of the economy, individuals have decided to rather hold onto their savings and look for a more substantial investment. It is during these difficult times that investors have come to once again appreciate the value of physical commodities such as the value of investing in diamonds. Finding a rough diamond and transforming it into a dazzling array of brilliance, fire and scintillation is a very involved process. Not only are the rough diamonds hand-selected from the South African mines to find the best quality, but it’s also polished and cut in house by a few of the world’s most talented craftsmen before it reaches the consumer. Like the woman of your dreams, the My Girl diamond is unique in every single way. Not only is the one of a kind diamond cut a true expression of your love and devotion, and perfectly suited for an engagement ring, but it also makes for the perfect anniversary gift. 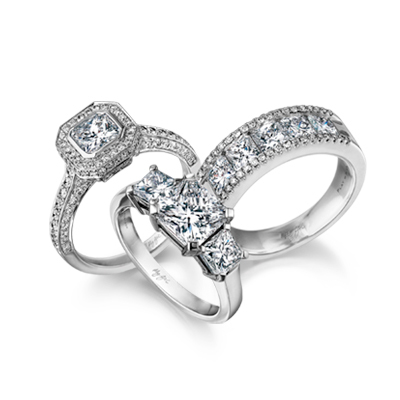 Not sure what engagement ring to get your significant other? At Shimansky we believe each bride has her own unique style and personality; therefore Shimansky provides a wide variety of different diamond cuts and shapes to suit each and every bride-to-be. Finding the perfect engagement ring is an important step when it comes to planning a proposal. Fortunately, with a variety of elegant diamond rings at Shimansky, you will most certainly find a ring that suits her style and reflects your love. Layering diamond pendants is on-trend worldwide with a number of stylish women compiling multiple chains and diamond pendants to create an even larger statement piece. The layered pendant look adds style and glamour to your appearance, but how exactly would one accomplish the trend without looking over accessorised? A black diamond has become a very popular alternative for the less traditional bride-to-be. The reason? The magnificent stone provides the bride with a variety of different styles and gives her an opportunity to create a unique signature jewellery piece. Are you planning to propose, but you’re not sure what style ring your significant other will prefer? Luckily, with an array of options at Shimansky, you will be sure to find the perfect ring that will capture the reflection of her personality and style. The way in which a diamond is formed is truly one of the most fascinating processes. But, the actual extraordinary moment when a breathtakingly beautiful gemstone is matched with an iconic jewellery design begins when a woman falls hopelessly in love with it. Planning a proposal is one of the most exciting things you will ever do in your life. Not only is it a special moment for you, but it’s a special moment for your significant other, who has dreamed about it since she was a little girl. With that in mind, you would like to make the proposal unforgettable. This will include a one of a kind engagement ring that perfectly fits her ring finger. It’s almost time for the world’s most influential stakeholders in African mining to come together and discuss the fascinating world of the mining industry. In only a few days Cape Town will be filled with members of the worldwide mining community dedicated to the capitalisation and development of mining in Africa. Remember how the sparks used to fly when you first started dating? Romantic dinners by candlelight, walks along the beach, movies, boat rides and spontaneous surprises filled the early days of your relationship. When it comes to celebrity engagement rings putting a price on it and deciding on the size certainly knows no bounds. As Elizabeth Taylor once said, “Big girls need big diamonds”. This month we celebrate the magnificent gemstone, Tanzanite - named the ‘December Birthstone’ in 2002. The fascinating and rare gemstone can only be found in Tanzania, at the foothills of Mount Kilimanjaro – the geographic origins after which the stone was named. After its discovery in 1967 the blue variety of the mineral zoisite has also become wildly popular due to its breathtakingly beautiful colour. Your love is unique. So, why not invest in a ring that truly reflects her style and taste? At Shimansky, we pride ourselves in offering just the best. Not only do we make sure that the most sought-after engagement rings in South Africa (which are crafted in the purest platinum and finest 18K gold) but we also provide you with the option to design the ring itself. When it comes to Cape Town, it’s hard not to feel overwhelmed by the multiple options of activities the beautiful Mother City has on offer. With that being said, we thought it would be fitting to supply you with a list of fun, breathtakingly beautiful and adventurous things to do while visiting Cape Town. Originating from Russia in the 19th century and dubbed “Russian Gold” the world has fallen in love all over again with rose gold or pink gold, which has a timelessly feminine appeal that has given way to a rising demand for rose gold engagement rings. Following the success of the My Girl Diamond, Shimansky is proud to announce the launch of the limited edition My Girl Perfume – a captivating fragrance drawn from natural rose oil that will reflect and enhance your own fire, brilliance and scintillation. On a visit to Cape Town during the filming of the 2012 action thriller Safe House, talented Hollywood and Oscar-nominated actress, Vera Farmiga received a limited edition Shimansky My Girl Perfume prior to the official launch. Selecting an anniversary gift should be guided by your personal taste. Our anniversary gift ideas will inspire in finding the perfect anniversary gift for her. Your wedding dress jewellery is important in creating your wedding day look. These wedding jewellery ideas will help you accessorise your bridal look flawlessly. Visiting Cape Town in September is the perfect time to enjoy the best the Mother City has to offer. Here is our list of best things to do in Cape Town in spring. Romantic proposal ideas with creative ways to hide the engagement ring, where to find engagement rings in Cape Town and surprise engagement ideas.